The previous Expanded Universe was thick with Luke and his quest to reestablish the Jedi Order and along the way, occasionally help his sister and friends save the galaxy from one threat after another. The Thrawn Trilogy by Timothy Zahn, which is credited with truly igniting the original Expanded Universe boom of the 90’s heavily featured Luke, as did Dark Horse comics’ Dark Empire series. In direct contrast to the old, Skywalker has simply disappeared from the storytelling perspective. In Wendig’s first Aftermath novel, Luke warrants only a couple mentions, and only a couple more in Life Debt. In Bloodline, which takes place a decade and change after the Aftermath novels, again, Luke is mentioned a few times, but never seen or greatly discussed. Why the absence? The mystery of Luke Skywalker was something of a McGuffin in The Force Awakens, his fate and whereabouts sealed tightly in J.J. Abrams ‘Mystery Box.’ As most now know, Skywalker only appears in the final minute of the film when Rey finds and offers him his original lightsaber. It is expected, and may invoke rioting if it does not happen, that we will learn Luke’s story and past in Episode VIII. That film just wrapped its primary filming and will premiere approximately a year and a half from now in December 2017. The question, then, is Luke’s past of such importance for storytelling purposes in Episode VIII, that the Expanded Universe has a de facto embargo on Luke’s actions not long after the Battle of Endor until Rey finds him? It’s hard to say, it’s a significant amount of time to pass, and for as much as we know from The Force Awakens, it appears Luke somewhat successfully establishes a Jedi Academy before his former student and nephew, Kylo Ren brings it to ruin. Or is the question simply, the best stories so far have simply not required Luke’s appearance? Luke has appeared in many of the new Expanded Universe works which take place before the final film of the Original Trilogy. In fact, Heir to the Jedi by Kevin Hearne, a story exclusively about Skywalker and told from his perspective, was one of the first of the new Expanded Universe novels to be released. Luke has also featured prominently in Marvel’s ongoing Star Wars comic series. Incidentally, both are set before The Empire Strikes Back. So we know that there’s not a general embargo on Luke Skywalker, simply on Post-Return of the Jedi Skywalker. As we mentioned, there is one exception, Shattered Empire. The four part series is focused on the parents of Poe Dameron, Shara Bey and Kes Dameron, who find themselves separately connected to our big three, Han, Leia, and Luke, in the months after the Battle of Endor. 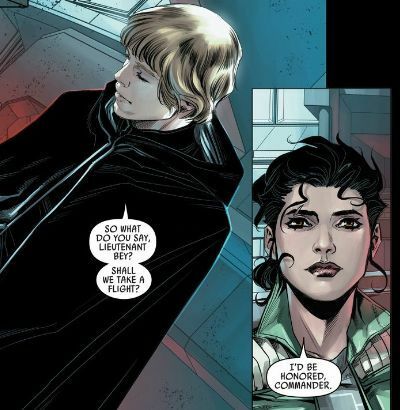 The final issue of the series featured Skywalker, who enlisted Shara Bey’s help in recovering saplings reported to have been taken from a tree which grew in the Jedi Temple on Coruscant. From that point on, Luke’s whereabouts and adventures disappear from the pages of our books and comic books. Given the secrecy that shrouded the character in The Force Awakens, our first proposed answer to Luke Skywalker’s absence is most likely the correct one. As no new additions to the Expanded Universe have so far mentioned that Luke will be apart of them, it may be until around December 2017 or after before we finally get to read about the last of the Jedi setting out to re-establish the Order of his father.